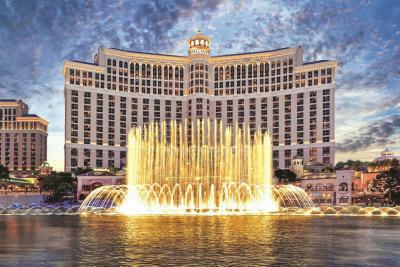 Lock in a great price for Bellagio – rated 8.7 by recent guests! Amazing place to stay at Vegas! Recommend 100%! If you go to Vegas try to stay at one of the big hotels, worth the money to live this Vegas experience. The location is fabulous, the public Access areas have been done up really well. This is a very classy hotel. The casino area was also a lot of fun. All in all one of the classiest hotels of Vegas, however, there is room for improvement in the in-room amenities. The service was really great. The room was comfortable (especially the bed). Beautiful hotel/casino. Friendly staff. Our room view faced the mountains and Caesars Palace. We loved our stay. The concierge was very helpful in getting a reservation at Lotus of Siam. Property is very clean and includes many facilities such as pool/jacuzzi, gym, garden, fountains, chocolate factory... etc. The hotel was a wonderful location to stay at, will stay again. Beautiful and clean. 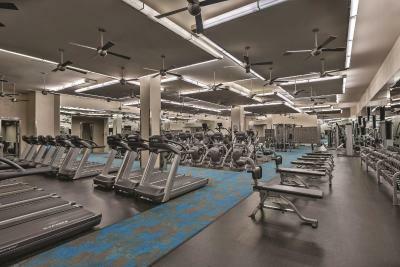 Great location and a ton of amenities! Room was great, spacious and clean. Bathroom was very big and also clean. Spa was really nice as well. I usually have a pretty low opinion of buffets (even in Vegas where they’re everywhere), but the buffet at the Bellagio is amazing. They have everything and it’s great quality. All restaurants within the Bellagio were great. We’re now on team MLife. 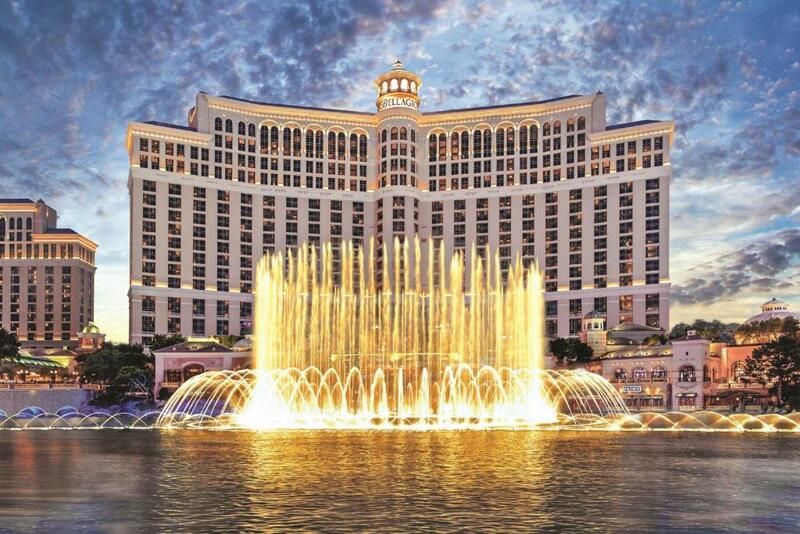 Bellagio This rating is a reflection of how the property compares to the industry standard when it comes to price, facilities and services available. It's based on a self-evaluation by the property. Use this rating to help choose your stay! 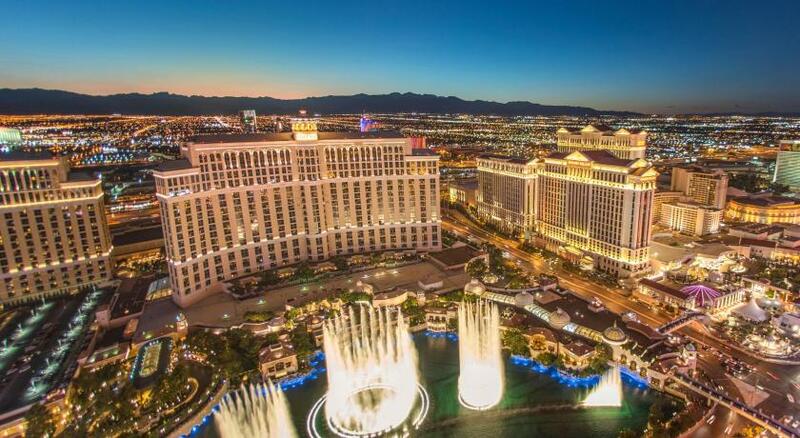 One of our top picks in Las Vegas.Set behind the famous Fountains of Bellagio, this luxury Las Vegas Strip hotel and casino offers an upscale day spa, multiple dining options and elegant rooms with marble private bathrooms. The Cirque du Soleil show "O" is on site. 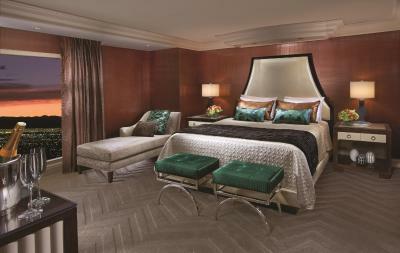 The richly-decorated rooms of the Bellagio are equipped with a flat-screen satellite TV and electronic drapes. Soft bathrobes, a mini-bar and an iPod docking station are included. 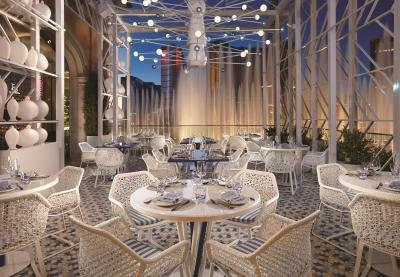 A wide-range of dining options is offered, including Michael Mina's fine dining restaurant, al fresco dining with fountain views at Picasso and contemporary Japanese dishes at Yellowtail. Sophisticated boutique shops are also within the hotel. 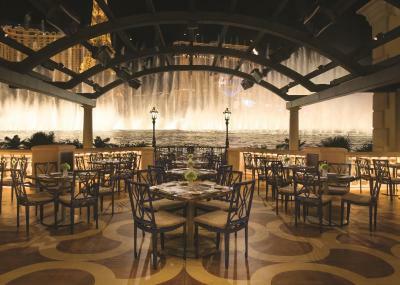 Conference rooms are also available at Bellagio. 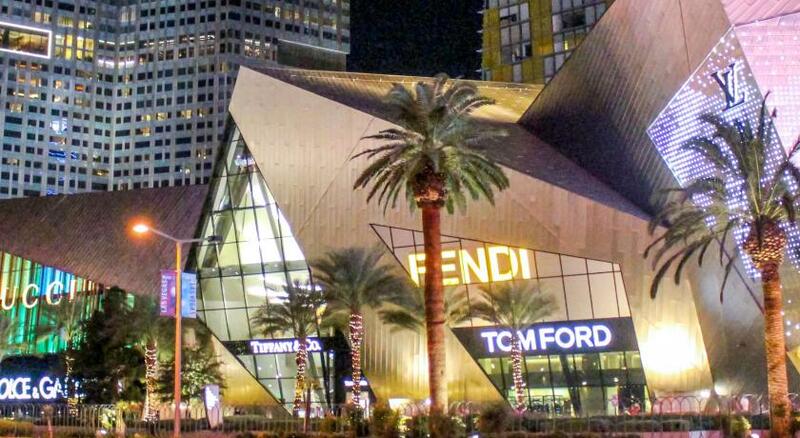 뀐 Located in the real heart of Las Vegas, this property has an excellent location score of 9.4! 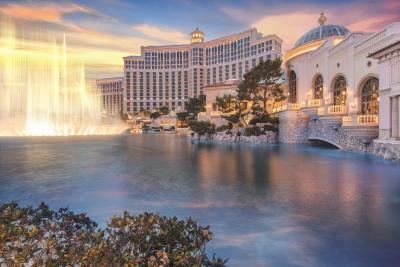 When would you like to stay at Bellagio? Located in the Spa Tower, these rooms provide beautiful vistas of the famed Las Vegas Strip with partial views of the Fountains of Bellagio. These elegantly furnished rooms offer marble floors in the foyer and a seating area with a frosted glass top desk and sophisticated entertainment center. Mood lighting, individual climate controls and individually controlled reading lights provide comfort. This room includes a 40-inch LCD flat panel HDTV, Bellagio branded cashmere top mattress, an iHome alarm clock, a personal in-room safe and automatic drapery with sheer controls and fully integrated technology that allows for mobile devices to be viewed on the screen. 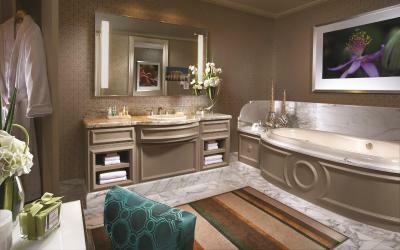 These luxurious Salone Suites are in either the Spa or Bellagio Tower at the end of the hallways. Decorated with elegant lines and rich colors, each of these spacious suites features automatic drapery with sheer controls, a Bellagio brand name cashmere top king bed, a relaxing lounge with a 42-inch LCD HDTV and an executive workspace. The spacious floor plan incurs over to the Italian marble and granite-topped bathroom equipped with a spa tub, a separate shower and deluxe spa products. Located in either the Spa or Bellagio Tower, these spacious suites feature a powder room, an elegantly furnished living room with a 42-inch LCD HDTV and an executive work space. The bedroom includes individual climate controls, a plush Bellagio branded cashmere top king bed and his and hers bathrooms. The Her bathroom is equipped with a spa bath with adjustable airflow jets, a vanity with illuminated make-up mirror and a separate water closet. 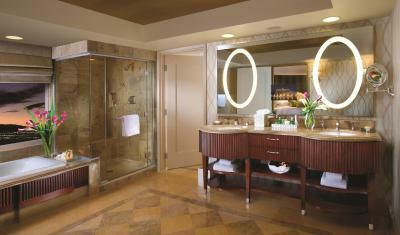 The His bathroom offers a shower with a bench and steam jets, robes and deluxe spa products. 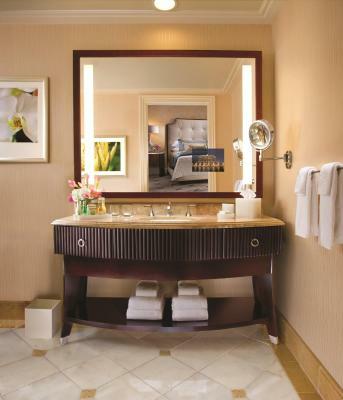 In the Spa or Bellagio Tower, the Penthouse Suites features an elegant powder room located off the marble entry, a wet bar overlooking the living and dining areas and a separate bedroom. The master bedroom includes individual climate controls, a Bellagio brand name cashmere top king bed and his and hers bathrooms. The Her bathroom comes with a spa tub with adjustable airflow jets, a vanity with an illuminated make-up mirror and a separate water closet. 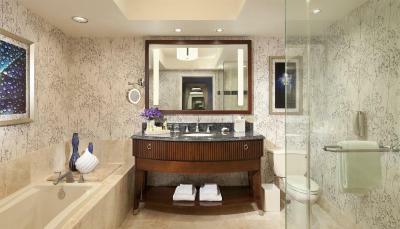 The His bathroom offers a shower with a bench and steam jets, robes and deluxe spa products. Inspired by Bellagio’s Conservatory & Botanical Gardens, this luxurious room is appointed with elegant furnishings which include marble floors in the foyer, a convenient seating area with a frosted glass top desk and a sophisticated entertainment center. Mood lighting, individual climate controls and individually controlled reading lights offer comfort. This room includes a 40-inch LCD flat panel HDTV, a Bellagio branded cashmere top mattress, an iHome alarm clock, an in-room safe and automatic drapery with sheer controls that uses technology so that mobile devices can be viewed on the screen. Located in the Bellagio Tower’s North and South wings, these rooms offer marble floors in the foyer and a convenient seating area with a frosted glass top desk and a sophisticated entertainment center. 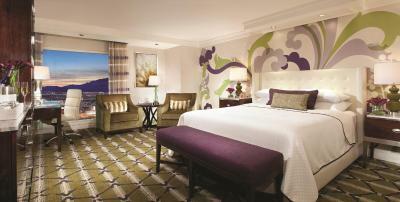 These rooms provide beautiful vistas of the famed Las Vegas Strip with partial views of the Fountains of Bellagio. Mood lighting, individual climate controls and individually controlled reading lights provide comfort. This custom designed room includes a 40-inch LCD flat panel HDTV, a Bellagio branded cashmere top mattress, an iHome alarm clock, a personal in-room safe and automatic drapery with sheer controls and technology which allows for mobile devices to be viewed on the screen. Inspired by Bellagio’s Conservatory & Botanical Gardens, these rooms exemplify a combination of timeless elegance and modern-day conveniences and feature either 1 king bed or 2 queen beds. These luxurious rooms have marble floors in the foyer, a convenient sitting area with frosted glass top desk and a sophisticated entertainment center. Mood lighting, individual climate controls and individually controlled reading lights offer guests comfort and convenience. This custom designed room is uniquely enhanced with sophisticated amenities including a 40-inch LCD flat panel HDTV, Bellagio brand name cashmere top mattress and automatic drapery with sheer controls and fully integrated technology allows for mobile devices to be viewed on the screen. Please note that the bed configuration is not guaranteed and will be assigned upon arrival. You can request your preferred bed configuration at the time of booking. Two buffets per stay are included with this special offer room. In the Bellagio Tower’s North and South wings, these rooms offer views of the Las Vegas Strip and partial views of the Fountains of Bellagio. Featured amenities include a 40-inch LCD flat panel HDTV, a Bellagio brand name cashmere top mattress, an iHome alarm clock, a personal in-room safe and automatic curtains with sheer controls and technology which allows mobile devices to be viewed on the screen. Guests can enjoy marble floors in the foyer and a convenient sitting area with a frosted glass-top desk and a sophisticated entertainment center. Mood lighting, individual climate controls and individually controlled reading lights provide additional comfort. Located in the Bellagio Tower, this air-conditioned room offers views of the famous Bellagio Fountains and the Las Vegas Strip. This room offers marble floors in foyer, a convenient seating area with a frosted glass top desk and a sophisticated entertainment center. Mood lighting, individual climate controls and individually controlled reading lights offer comfort and convenience. Room features sophisticated amenities including a 40-inch LCD Flat Panel HDTV, a Bellagio branded cashmere top mattress, iPod MP3 docking stations, a personal in-room safe and automatic drapery with sheer controls and fully integrated technology allows for mobile devices to be viewed on the screen. Inspired by Bellagio’s Conservatory & Botanical Gardens, these rooms exemplify a combination of timeless elegance and modern-day conveniences and feature either 1 king bed or 2 queen beds. These luxurious rooms offer marble floors in the foyer, a convenient seating area with frosted glass top desk and a sophisticated entertainment center. Mood lighting, individual climate controls and individually controlled reading lights offer guests comfort and convenience. This custom designed room is uniquely enhanced with sophisticated amenities including a 40-inch LCD flat panel HDTV, Bellagio branded cashmere top mattress and automatic drapery with sheer controls and fully integrated technology allows for mobile devices to be viewed on the screen. Please note that the bedding configuration is not guaranteed and will be assigned upon arrival. You can request your preferred bedding configuration at the time of booking. A valid credit card must be presented upon check in and you will be required to charge Buffets to your room for redemption prior to check-out. Promotion valid for a maximum of two (2) breakfast or lunch Buffets per night per room. Complimentary Buffet Credit is valid for breakfast and lunch only and is not valid on Holiday Pricing Dates or date of departure. Unused Buffet Credit(s) will not be refunded and have no cash value. The credit is valid at participating outlets only and excludes gratuity. This double room features a mini-bar, bathrobe and iPod dock. 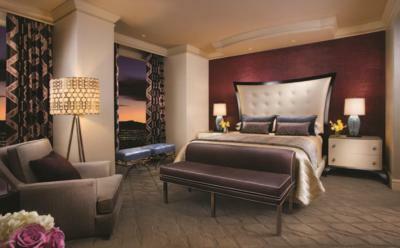 Please note: This room type features either 1 king or 2 queen beds. The bedding configuration is not guaranteed and will be assigned upon arrival. 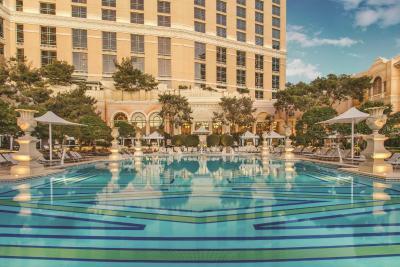 Grant yourself the luxury of discovery time as you explore the dramatic features which distinguish our exquisite Las Vegas resort from every other destination in the world. 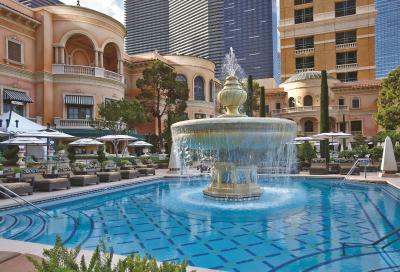 House Rules Bellagio takes special requests – add in the next step! Bellagio accepts these cards and reserves the right to temporarily hold an amount prior to arrival. 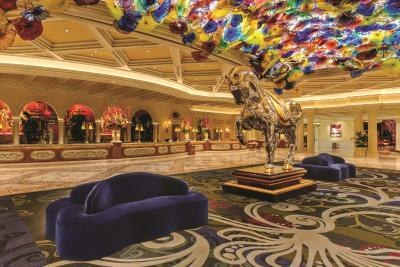 For your convenience, the Bellagio offers self-parking in our Main Parking Garage, as well as Valet Parking for a fee. Please see hotel policies. The parking fee provides in-out privileges for the same parking type (self-parking or valet) across all MGM Resort destinations. Regarding the cancelation policy: The 72-hour cancelation window closes at 17:00 three days before the arrival day. You must be at least 21 to check in. Please ensure the original credit card used at the time of booking is presented during check-in. In case of an early departure, the guest will be responsible to pay the full remaining amount (room rate and tax) of the reservation. Up to 2 dogs are allowed, with a maximum combined weight of 40 pounds or less. Please contact the hotel for specific charges. 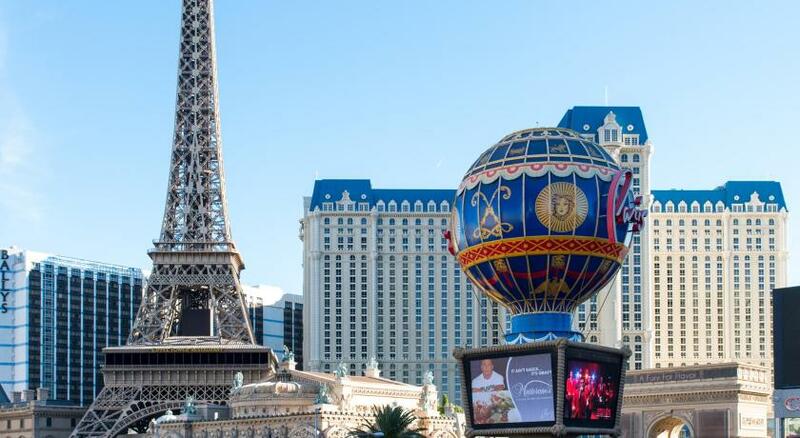 Bellagio is overpriced, compared to other hotels in the Strip. No complimentary bottled water, when you call for service the line is always busy,. Value for money, no. Other hotels are cheaper , better service and you get more for your money. You need to pay extra for the wifi where everywhere else is for free. The bed was the most comfortable we have experienced. Concierge was friendly and helpful. Smoking - Having smoking allowed within the hotel, especially the casino area was vile. Stunning building and location, exactly what you would expect but rarely receive. Bellagio was superb! Some of the staff are in definite need of training, notably the buffet staff and some of the reception staff. Ann in the piano Bar is an absolute gem and always happy to serve us and see us. It is a beautiful hotel in every respect. I love the pool area and the piano bar in particular. After an argument about our laundry i am pretty sure the valet defalted purposely a tyre on our car. All staff to do with the casino was great! So were the restaurants. The staff were generally rude and unhelpful. Our check-in process took over an hour because they had originally lost our booking (despite me having a booking confirmation number and having paid the depsoit). They then told us that they were fully booked and we needed to call Booking.com. They offered no assistance. Turns out they weren't fully booked enough to try and sell us new hotel rooms at a higher price. There is no ability to place anything in the fridges. If you move anything it automatically charges regardless of whether you ate/drank the item. Not helpful at all when travelling with small children and needing to store milk, etc. I stayed here around 5 years ago and it was a lot better service and the rooms are getting a little worn out. Location on the strip. Pool facilities. The receptionist seemed really bored. Great location and facilities, really liked the outdoor/pool area. Central location with super comfy beds and lovely staff! No kettle No toiletries available The hotel uses people. It charges guest for extra money. They changed me 17 $ when I check out for using the mini bar although I didn’t take anything . When I said I didn’t take anything they canceled it immediately without even check the room which means they do the same with each guest and if they don’t notice they pay.